With plenty of moving services, Meathead Movers is fully prepared to make Oak View your new home. Our clean-cut student athlete movers are dedicated to fulfilling all your moving needs efficiently. Welcome to Meathead Movers of Oak View! Oak View is a small quaint unincorporated community in Ventura County. Oak view is the perfect place if you are looking for that cozy small town atmosphere. With a population of just over 4,000, you will quickly find yourself at home in this beautiful community. If you are considering a move to Oak View, Meathead Movers is here to help. Our moving company specializes in local, long-distance, and commercial moves to, from, and within Oak View. We also provide reliable packing, storage, on-site relocations, and our distinctive moving concierge service, which connects you with local service providers. All our student-athlete movers are thoroughly screened and trained before their first move. 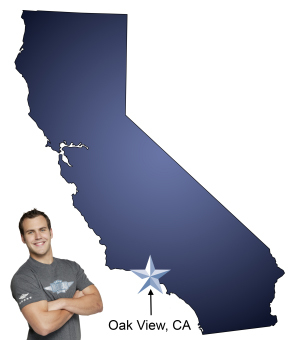 With branches not just in Oak View, but all throughout California, we are your one-stop resource for all your moving needs, no matter where your California move takes you. In fact, you can see what your neighbors in Oak View have to say about us. With our 100% satisfaction guarantee, the only thing you have to lose is the stress that comes from moving! Contact us today for a free no-obligation moving quote and to learn how we can help you on your next move! Moving to Oak View? Here are some helpful resources. View more Oak View resources. First crew of guys I had we're great! The second crew not so much.. They seemed unmotivated to get the move done.. My wife was not happy at all..
Pre job call, prompt arrival, friendly greeting, clear job breakdown and job planning, cautious and safe execution. This was repeated at the drop off location. The guys were professional, cautious, and thoughtful. Well done! Very impressed with Matt and Nathan especially. These guys are the BEST!!! Take all the stress out of moving, simply call and relax, they will handle everything. I really could go on all day, let's just say we were beyond happy with their service.